Wow, there were some really funny entries for Caption Contest 66, thanks to everyone who took the time to make a submission! I think this is the longest Honorable Mention list I've ever had, but they were just that good. Ultimately, of course, There Can Be Only One, and this week that One is first time winner Tim! It probably says more about my completely random and odd sense of humor than anything, but that makes me laugh every time. 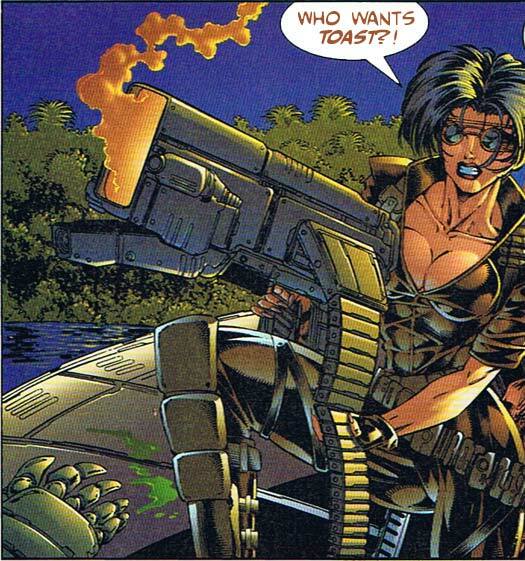 The ejection nozzle on that "gun" just screams "TOAST!" to me now whenever I see it. Plus I love the idea of that expression on that "woman" as she wades into battle, flinging lightly crisped bread products willy-nilly. It walks that fine line between head-scratching legitimate war-cry and completely inane blather that truly is the hallmark of the Image Nineties. Well done, Tim! He receives his choice of either his portrait or any item he likes to be included in the final HM3 version. Blue Blazer: That’s for wiping snot on the side of my pool. Danny Beaty: Keep your “Watchtower” and give Jehovah my regards! nick: when life hands you ammo, buy a bigger gun. Aaron: Yes this is a gun…..and no I am not happy to see you. Patrick: I have what kind of envy now?! Loki: Now that’s what you call a bullet-bullet! GreenBat: I’ll let these guns do the talking. Jake: You should see my big gun. D: That’s not a hairdryer! THIS…is a hairdryer! 12 Responses to Caption Contest 66 Winner! Im Back Yaaaay, Congrats Tim. @Jeff: What’s the next contest? I’ll have to think about my prize Jeff. Man, all day I thought the new contest post was up, and I was wondering why no one was submitting any entries. Went to a movie with my wife, came back, still no entries, and then it hits me (thanks to a poke from Hammerknight) — I previewed it but forgot to hit “Publish”. Sorry fellahs, it’s up now! I think I’ll go with the .50 Caliber Smith and Wesson Model 500 Magnum, the strongest handgun currently in production. No doubt that is stronger than the S&W (and more expensive too lol), but it’s a custom made weapon, Gero. There’s nothing wrong with that, I just prefer the S&W because it’s currently in production. The S&W can take down an elephant, I can only imagine what the Zeliska can do! Yeah no doubt they’ve both earned mass respect, but I still can’t get over the massive price difference between the two. It’s insane!